Attractions in Belfast, Co Antrim. 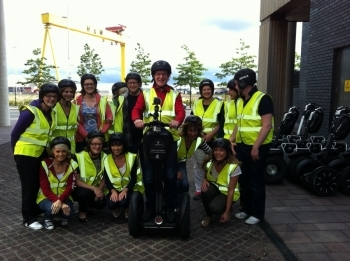 This is the first and only Segway City Guided Tour in the UK! Led by our tour guide, you will glide along on one of our futuristic Segway machines and explore the sights and key locations which made the world’s most famous ship – Titanic. This tour has been developed to give all Segway riders the fun factor as well as the key facts regarding the areas you will visit. The tour will be delivered via a GeoTour mobile application specially developed for all types of smart phones. You will download this app at our shop using our free Wi-Fi before the tour begins. The GeoTour has been created to deliver audio commentary at specific GPS locations on the tour, allowing you to relax and enjoy the Segway tour. The Segway tour is available in multiple languages (English, Spanish, French, Germany, Italian and Chinese). All rider are provided with suitable safety equipment* (you are welcome to bring your own helmet if you wish).